Aarti is a process in which any medium of fire eg candle, diya, incense stick is rotated clockwise and anti-clockwise to remove negativity and increase positivity. It is done after a Sadhna, meditation or after your daily pooja. It is very important to understand the fact that Aarti is not done for the idol or the Guru but it is done to thank the universal energy that reside in the Guru or the energy that you pray to, in the form of the idol. It is a process to thank the universal energy that has blessed us. Aarti develops the feeling of submission (Samarpan) and this feeling in turn removes negative thoughts and energy in us. This happens because with submission we tend to let go and submit to the will of the supreme power which then relieves our negative energies as part of its blessings/kripa. Everything that we offer during the aarti like fruits, flowers etc and the process of dancing during the aarti also develop the feeling of submission and devotion. They are the symbolic representation of submission of a certain aspect/part of our daily lives. For example the coconut represents our head, fruits and certain eatables represent the specific element (Earth, Air, Water, Fire, Ether) which gets purified. The Diya which is lit during the aarti purifies all that area, infront of which it is rotated. You may be rotating it in front of the idol or Guru, but it actually purifies the doer at spiritual, mental, physical and emotional level. Aarti is also a medium of expressing our love towards our God, Guru or the energy we believe in. The diya in aarti signifies the fire element. Fire is a very powerful element and destroys everything that is negative. As we rotate the diya in front of the guru or the idol, it purifies the respective part of us. The fire element also symbolizes enlightenment, knowledge and wisdom. The objective of diya in the aarti is to remove the darkness from our life and illuminate our path with wisdom and success. Fire also symbolizes our soul. Lighting the diya during aarti represents offering our soul with devotion. When the feeling of devotion unites with the aarti then the pure fire element transforms into the fire of love and submission. This helps a person to touch great heights in the path of spirituality. 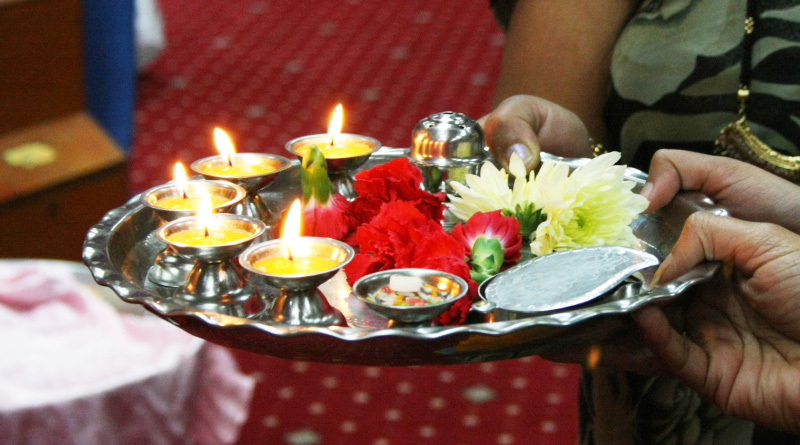 Sidhshakti Aarti has 5 diyas in it, which denotes the 5 elements in us. When these 5 diyas are rotated then they balance the 5 elements of the area where it is rotated. That is why, it should be rotated on the whole body. Sidhshakti Aarti is rotated by forming the digit 8. The digit eight has three joining points. 3 LOK – BHU-LOK, AKASH-LOK, PATAL-LOK. 3 GUN – SATV-GUN, RAJO-GUN, TAMO-GUN. 3 CHIT – VAT, PIT, KUFF. 3 SHAKTI – BRAHMA, VISHNU, MAHESH. 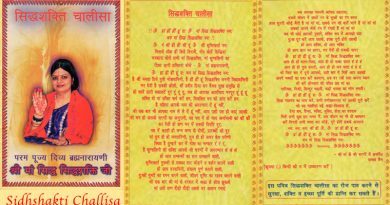 3 DEVIYAN – MAHALAKSHMI, MAHAKALI, MAHASARASWATI. 3 NADIYAN – IDA, PINGLA, SUSHUMNA. Thus, all 3 energies of the 5 element purifies and balances, when we rotate the thali in the form of 8. If we notice 5 + 3 = 8. 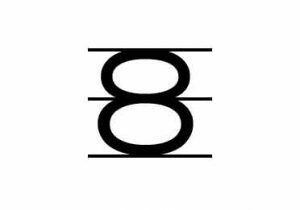 The digit 8 is symmetrical in itself, no matter where you cut it from. Thus it is known to be a strong and balanced form/digit. When the thali is rotated in the form of 8, then the three main chakras – Muladhar, Anahat and Sahasrar Chakra, which comes in the path gets purified, which in turn balances all the chakras. If we clearly see, then the Ida and Pingla nadi also move upwards in the form of eight and the Sushumna Nadi moves upward straight. 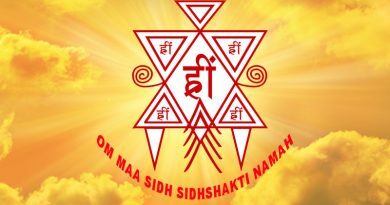 The Mahamantra “Om Maa Sidh Sidhshakti Namah” in hindi is also formed by 17 alphabets and 1 + 7 = 8. 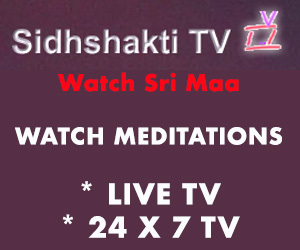 Sri Maa Sidh Sidhshakti Ji’s birth date is 26,which also forms 2 + 6 = 8. 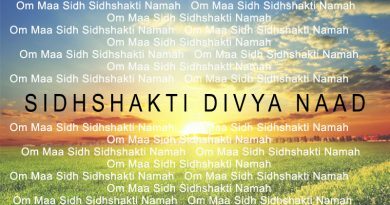 Sri Maa Sidh Sidhshakti Ji’s full birth date is 26-12-1959, and if add the digits, it also forms 8. “Om Namah Shivay” when chanted in hindi also has 8 alphabets. Our DNA is also in a form of eight. 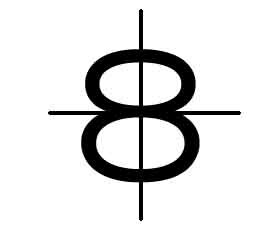 Digit 8 also denotes the serpent energy, which is the most powerful energy in the universe. When 8 is rotated in the 90 degree then it denotes infinity. 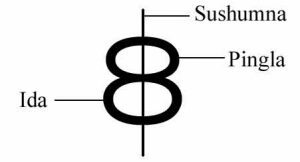 8 is the digit of Mahalakshmi (Goddess of wealth). Scientifically diamond has 8 sides, which is the strongest matter present in the world. 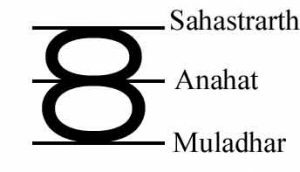 8 is the digit of God Shani and the God Shani is the God of Sahasrar Chakra and looks after our karmas. The Aarti thali is rotated clockwise and anti-clockwise – Clockwise rotation increases the positive energy and the anti-clockwise energy decreases the negative energy. Musical instruments like bells and Shankh are also used in aarti to clear the negative energy and to get rid from the black magic. Ghanta (Bigger form of bell) and Ghanti (Smaller form of bell) denotes the male and female energy. When they are rung together, they balance the male and female energy. Aarti is an important and scientific way to bring about positive changes in life. One can get rid of every problem by doing the aarti with faith, devotion, love and submission. When and how to do Aarti? Aarti should be done everyday in the morning and evening. Sidhshakti Aarti should be done by forming the digit 8. Water kept in the aarti thali should be taken as ‘Prasad’ to purify yourself physically.